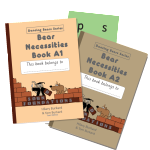 Bear Necessities is the ideal synthetic phonics programme for very young children who are falling behind. No lesson-planning, record-keeping or paper work—and no expensive training. You won’t believe that something so simple can work so well.